DENVER, Colo. (Embargoed until 2 P.M. MT, Sunday, June 11, 2017) – A new study shows that a hybrid molecular imaging system unites three imaging modalities to map the composition of dangerous arterial plaques before they rupture and induce a major cardiac event. The research was presented at the 2017 Annual Meeting of the Society of Nuclear Medicine and Molecular Imaging (SNMMI). Certain types of plaques associated with atherosclerosis are prone to instability and tend to break apart, which can lead to embolism and sudden death, if left untreated. Lesions called thin-cap fibro atheroma (TCFA) are especially prone to rupture. Stanford University researchers have developed a scanner that unites optical, radioluminescence, and photoacoustic imaging to evaluate for TCFA. Early diagnosis and treatment could save lives by preventing the progression, and subsequent rupture, of these plaques. 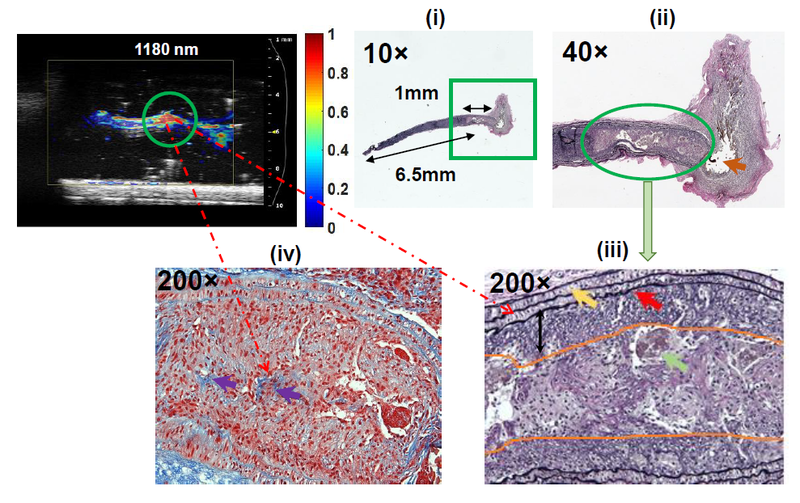 That is precisely why researchers designed the Circumferential-Intravascular-Radioluminescence-Photoacoustic-Imaging (CIRPI) system, which allows not just high-acuity optical imaging via beta-sensitive probe, but also radioluminescent marking inside the artery to determine the extent of inflammation. Photoacoustic imaging also provides information about the often-complex biological makeup of the plaques (how much is calcified or comprised of cholesterol or triglycerides). “This is an important and potentially life-saving tool that could one day be used by interventional cardiologists to identify the appropriate treatment plan for patients at risk of future TCFA rupture,” explained Zaman. For this study, researchers focused on atherosclerotic samples of both human and mouse carotid arteries and performed CIRPI following injection of fluorine-18 fluorodeoxyglucose (18F-FDG). 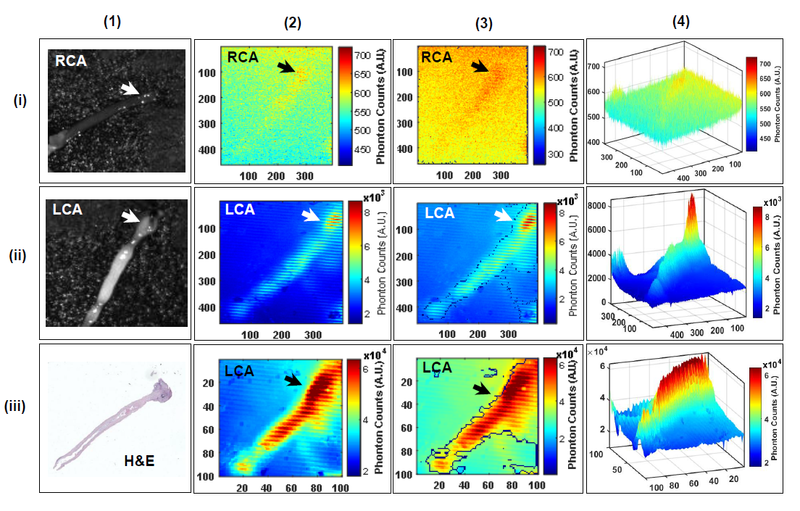 Photoacoustic lasers were used at different wavelengths to delineate plaque composition. The result was a never-before-seen 360-degree perspective of arterial plaque burden, confirmed effective by follow-up radiography, ultrasound and histology. According to 2017 statistics from the American Heart Association, cardiovascular disease, including but not limited to coronary artery disease, accounted for more than 17.3 million deaths worldwide in 2013—making it the leading global cause of death. The toll is expected to rise to 23.6 million by 2030. Coronary heart disease is estimated to cost an average of $10.4 billion annually. This amount is expected to increase by 100 percent from 2013 to 2030. Scientific Paper 31: “Harnessing Radioluminescence and Sound to Reveal Molecular Pathology of Atherosclerotic Plaques,” Raiyan Tripti Zaman, Siavash Yousefi, Steven R. Long, Christopher H. Contag, Sanjiv S. Gambhir, Butras Khuri-Yakub, Lei Xing, Stanford University School of Medicine, Stanford, Calif., SNMMI’s 64th Annual Meeting, June 10–14, 2017, Denver, Colo.